Firefighters are continuing their work to extinguish a large fire at a Chichester tip which broke out yesterday evening. West Sussex Fire and Rescue Service was called to a large fire at Westhampnett amenity tip in Stane Street, Chichester, at 8.25pm. This morning, two crews remain at the scene. The spokesman said the incident had been scaled down but said: "It's still smoking a lot, it's still going." 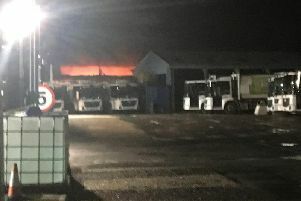 A spokesman wrote on social media: "Over night the crew of Petworth fire station were alerted to attend a fire at the community waste recycling facility in Chichester. "The incident is still ongoing with a large volume of rubbish burning.